Not to be left out of the holiday hype, Liftopia, the big online lift ticket and ski rental discounter, is running some specials through Monday. 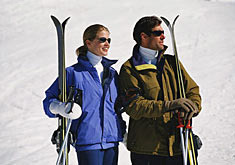 The promotion includes more than 150 resorts in North America, including most of the big ski centers in the U.S. and Canada. Discounts vary widely among individual ski centers, ranging from an almost-trivial 10 percent to a substantial 79 percent. The current promotion covers the full ski season in some locations, but sale prices at some locations are available only during the early or late parts of the season. Presumably, prime dates may open up later. Check the agency for details. And, as typical, the promotion is subject to availability. Your turn: Do discounted lift tickets make you more likely to take a ski vacation this year?